Jorge Bermúdez, Professor of Art and Communication at Havana University, is the author of the most complete study on cuban posters ever made. 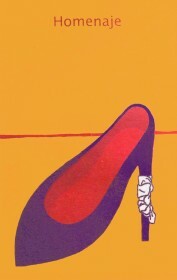 Published in 2000 and winner of a prize by Casa de las Américas as best artistic-literary essay in 1998, it constitutes the best history on cuban posters and graphics; it focuses on revolutionary posters (both political and cultural) but also studies their roots, tracing their origin back to the 19th century. Moreover it helps understanding the context from the cuban point of view (often the official one, without being strictly ideological). The cultural and historic context is constantly explained in this book whose chapters order follows a chronological line, from the 19th century (concentrating the pre-revolutionary period in the first two chapters) up to the present, analyzing in detail the revolutionary period. This is essential because the author studies posters from a historical-sociological perspective and not simply as works of art. Considering the fact that in a socialist country like Cuba posters represent a strategic communication tool, every single poster should be analyzed in its specific context and historical moment to really understand it. One hundred years ago, the famous painter and graphic designer Toulouse-Lautrec defined posters as "a shout on a wall". Professor and researcher Jorge Bermúdez applies it to cuban graphics and demonstrates that the French artist's statement was right and, moreover, that posters represent a very special chronicle of the historical moment they're inserted in. The everyday fact, the most spectacular happening, the persuasive spot, the mobilizing announcement, the celebration of political victory, the invitation to see the best movie ever seen or to listen to the most virtuous musician...the whole life of a society has been reflected in a way, like a constant image - La imagen constante -, in the graphic work of cuban designers. To the purpose of explaining the context many aspects are taken into account: for example chapter 5 is dedicated to the graphic industry under the Revolution and throuhout the whole book there are many hints on the way of working of graphic designers; to understand the importance of images in the cuban Revolution the book also analyzes the evolution of photography and mass media in general; to get into the cultural context it points out the ideological opposition between the defensors of socialist realism and the "vanguardists". 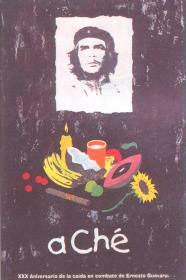 Thanks to the author's knowledge of the inner context we get to know aspects that are otherwise difficult to discover: for example that the title of the 1997 poster of Daniel Cruz, aChé, is a playful combination between the famous argentinian interjection "che" (hence Ernesto Guevara's nickname) and the word "aché", taken from afro-cuban santería, meaning prosperity, good luck. 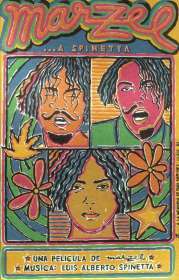 Once again the context helps to understand posters: in this case not only a word taken from the afro-cuban syncretic religion, but also the fact that the 90's are a period of opening toward religion and so that this kind of representation became possible. Another important aspect is that this book is a fundamental key to understand the cuban posters of the 1990's, which have not received as much attention as they deserve. Here we get in touch with a really talented group of graphic designers called Next Generation. 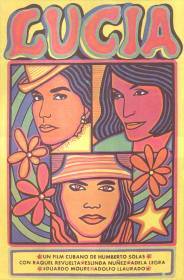 The author shows that though inserted in a period of dramatic crisis (the "período especial") with a general scarcity of material, their posters go on showing a special cuban taste and creativity. Manuel Marzel, Marzel...a Spinetta, ICAIC, 1995. The most important sites on cuban posters can be found in the link section of the Eduardo Muñoz Bachs memorial exhibition. Elisabetta Tesser is a graduate student at the Universitá Cá Foscari, dipartimento di Lingua e Letteratura Spagnola, in Venice (IT), and has just completed her thesis on "Comunicacion social y politica en los carteles cubanos posrevolucionarios"